The Axis of Awesome are The World's Most Awesomest Comedy Band. In the incredible time that they have been together, they have done literally so much stuff. They have blown audiences away across Australia and around the world with their mixture of original comedy songs and pop parodies. Their 'Four Chord Song' is one of the highest rated comedy videos of all time on YouTube, and has received over 42 million hits. They have made TV appearances in Australia, the UK and Sweden and their albums Scissors, Paper, ROCK! and Infinity Rock Explosion and DVD The Axis of Awesome Live are hits with audiences worldwide. 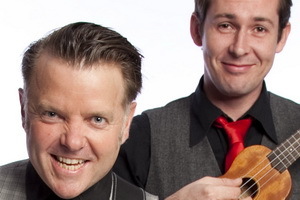 They recently picked up the Time Out Award for Best Australian Act at the Sydney Comedy Festival, and they are also recipients of the prestigious Moosehead Award for their first ever Melbourne International Comedy Festival show, 'The Axis of Awesome Comeback Spectacular'. 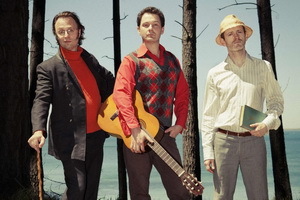 Their most recent show 'Songs in the Key of Awesome' had its Australian premiere at The Sydney Opera house, and was followed by a tour of the United States. They leave men laughing and women gasping (and also laughing), and before long you'll be laughing and/or gasping along with them, depending on your gender. Jordan Raskopoulos: Lead vocals. Star of stage and screen, Jordan is best known for his work on Network Ten's The Ronnie Johns Half Hour. His memorable characters and humorous lines were both memorable and humorous. Currently a National Theatresports Champion, Jordan was nominated for Best Newcomer at the 2007 Melbourne International Comedy Festival for his one-man show, 'The Adventures of the Man With the Dominant Claw'. Jordan enjoys Snickers bars and the music of David Bowie. Benny Davis: Keyboard, vocals. A classically trained musician, Benny brings some class to the Axis. And a portable keyboard. 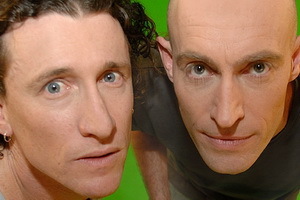 As an original member of the sketch comedy troupe The Delusionists, Benny was a stand out in their 2007 Melbourne International Comedy Festival Show. A regular cast member of almost every improvised comedy show in Sydney, Benny is a virtuoso on the keyboard. Benny enjoys Super Mario Galaxy on Nintendo Wii and the music of Billy Joel. Lee Naimo: Guitar, way way back up vocals. One of Sydney's best improvisers, Lee has made stuff up while touring Australia and internationally. 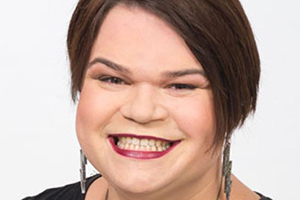 Along with Jordan, Lee is a current National Theatresports Champion and co-creator of the hit live show 'SCRABBLE Unscripted', which was a sold-out success at both the Melbourne and Sydney Cracker Comedy Festivals in 2006 and 2007. Lee enjoys sunshine and the music of Hannah Montana. The Axis of Awesome are one talented band. Not only are they gifted musicians, they are also witty, intelligent, can sing in two languages and are highly entertaining. Their performance was a highlight of our event and kept even the most corporate of crowds wanting for more. We asked the Axis of Awesome to play a gig in Parliament House as part of a showcase profiling the exceptional online talent in the Australian screen production industry and they very kindly obliged. Benny, Lee and Jordan performed a few of their biggest hits in front of an audience of Senators, Members of Parliament and screen industry professionals, and won them over with their incomparable comedic musical talents. We sincerely hope to work with these lovely people again in the future! We were looking for a refreshingly different entertainment act for our client event this year and we sure found it with The Axis of Awesome. They were sensational! They had all our guests laughing from start to finish. A very talented trio, musically, and a fabulous comedy act. We have received lots of positive feedback from clients and staff about their enjoyment of the performance. 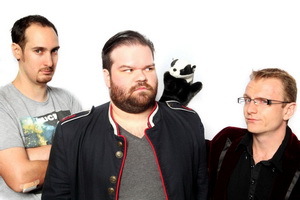 The Axis Of Awesome boys are a dream to work with on many levels. As a PR agency, we rely on partnering with extremely talented and professional performers to build amazing campaigns on the behalf of our clients. The boys delivered on producing a hilarious track, great on screen performances, coupled with a 'can do', easy-going attitude that impressed everyone involved. Very enjoyable to work with and we would all definitely have no hesitation in working with them again.